An incredibly yummy cinnamon roll perfect for breakfast or brunch. Make most of it the night before so they're ready quickly in the morning. Start making your dough by heating your milk just until it is steaming. Add the tea bag and let it steep for five minutes while the milk cools somewhat. Remove the tea bag, and add your milk to your mixing bowl. Top with your yeast, sugar, salt, and 1 cup of flour. Mix until thoroughly combined. Add your softened butter and mix again. When mostly incorporated, add the egg and bring to medium speed to beat together. Once incorporated, add your remaining flour slowly to ensure your dough isn't too dry. Mix on low speed until your dough comes together in a ball. Remove the dough to a lightly floured surface and knead for five to ten minutes, until the dough springs back when you press lightly into it. Return to your bowl and cover with a towel. Let rise for an hour until doubled in size. Remove the dough from your bowl once risen and roll out to a 9 by 15 rectangle. Using the wrapper as a holder for your 1/2 cup of butter, spread it over the dough, leaving a one inch gap along the top long side so the dough will still stick later. Use the wrapper to spread any remaining butter into the bottom and sides of a 9x13 pan so that your cinnamon rolls won't stick to it later. Mix together the remainder of your filling in a separate bowl. Use a fork to combine the sugars, cinnamon, nutmeg, and cloves. Spread this over the butter on your rectangle using your fork. Roll up your rectangle into a long log, starting at the bottom and leaving the uncoated edge for the end. Use a serrated knife to slice into 12 equal pieces. Carefully lift each piece and place it into your buttered pan. Some will touch and others won't. Replace the towel and let rise for 30 minutes or place in the fridge overnight to finish in the morning. If finishing in the morning, remove the rolls from the fridge and let sit on the counter, still covered by the towel, for 45 minutes. Preheat your oven to 350 degrees while your cinnamon rolls are rising. Once they are ready to bake, remove the towel and bake uncovered in your oven for 30 minutes until golden brown and the filling has started to bubble at the edges. Cool in the pan while you make the glaze. 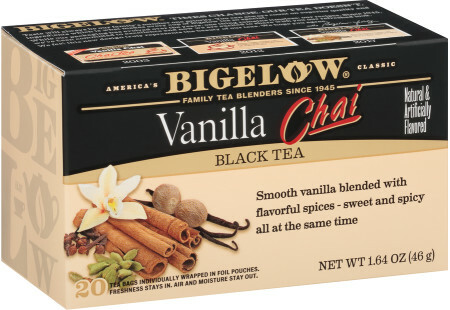 Brew a cup of Bigelow vanilla chai tea. In a small mixing bowl, add melted butter, vanilla, and powdered sugar. Pour the hot tea over this. Using a fork, stir until thoroughly combined, adding a bit more tea to thin the glaze if needed. Pour the glaze over your cinnamon rolls and enjoy immediately. Note - These are best eaten the day they're made but can be stored on the counter in a tightly sealed container for another 1-2 days, if needed.